Lock in a great price for Hotel Jibal Chaouen – rated 8.8 by recent guests! Wonderful stay! Beautiful hotel with great amenities. The view from our suite was breathtaking. 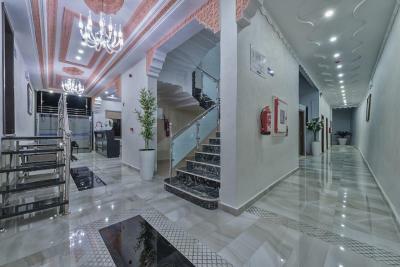 Easy parking, walking access to the Medina/blue city. The staff was amazing, so helpful, so nice. We will definitely come back and recommend the property to all of our friends. Staff was really nice. Big room, comfy bed, nice view, good breakfast. 10min walk distance to medina. Very friendly staff, especially the guy youssef in the cafeteria. Room is excellent, very clean, very comfortable bed, all the facilities of hotel are very good, reasonable price, the view is excellent. Breakfast is delicious and fresh. The hotel itself was great.. it's location shower.. breakfast.. bed.. staff.. restaurant.. parking.. was all good.. but what made the difference was their staff.. Hassan and fatimah particulaly.. they were very welcoming and warmth.. they attend to our needs with great care and compassion.. they are like family.. will definitely recommend to anyone.. anytime..
Everything was perfect ,if i want to go another time , i will book the same hotel . Located in Chefchaouen, within a 13-minute walk of Ras Elma Water Source and 0.9 miles of Mohammed 5 Square, Hotel Jibal Chaouen has accommodations with a shared lounge and free WiFi. Popular points of interest around the property include Kasba and Outa El Hammam Square. Staff on site can arrange airport transportation. All guest rooms at the hotel come with a seating area and a flat-screen TV with satellite channels. All rooms have air conditioning, and certain rooms also offer a terrace. All rooms have a desk. Speaking Arabic, English and Spanish at the reception, staff are always on hand to help. Khandak Semmar is 1.6 miles from Hotel Jibal Chaouen, while Mnt, J. Tissouka is a 9-minute walk away. The nearest airport is Sania Ramel Airport, 43 miles from the accommodation. When would you like to stay at Hotel Jibal Chaouen? House Rules Hotel Jibal Chaouen takes special requests – add in the next step! Hotel Jibal Chaouen accepts these cards and reserves the right to temporarily hold an amount prior to arrival. The mattress was a little bit too firm for my liking. Sometimes during the night dogs were barking but I think that will be everywhere in the town because there are many street dogs. Easy access. Free parking in front of the hotel. Very clean room. Amazing breakfast. Very kind staff. Nice short 10 min walk to the medina. Finishings in the room are of a poor quality, the great morrocon craftmanship in the building trades zeem to have been lost! A nice, new hotel with helpfunctie and friendly staff. A beautiful view on Chef Chaoun. All was good, nothing to complain! !